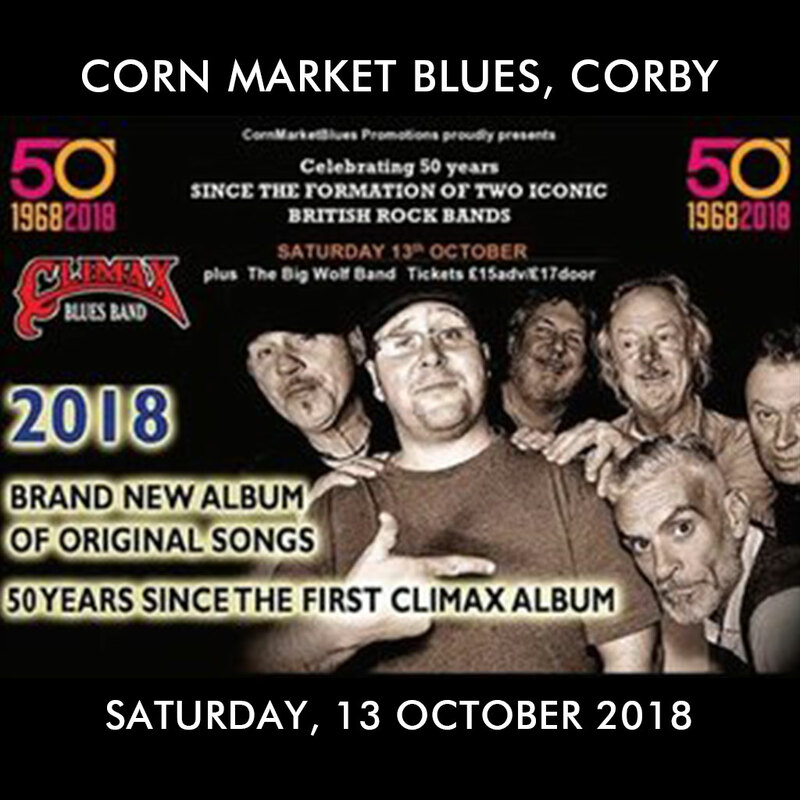 Climax Blues Band to play Corn Market Blues, Corby, Northants on 13 October 2018. Climax Blues Band are delighted to announce that they will be headlining a gig at the Corn Market Blues in Corby, Northants. We hope to see you there! Come on out and see us at Corn Market Blues on Saturday, 13th October, 2018. Support act is the Big Wolf Band. You can buy tickets through this link. This solid unit has flown the Climax flag with tremendous passion and style. Now there is a spring in their step, taking the band forward and already pleasing crowds throughout Europe, the ‘seamless’ transition in carrying on creating the unique Climax sound is the result of hard work, disguised by a band having a great time making music. Graham Dee was recruited in 2012 to front the band. With his own distinctive style and a pedigree on the blues scene which included performing with The Blues Collective, The Red Lemons and joining ex-Feelgoods in The Lone Sharks as well as session vocals and voice coaching. At the same time Chris ‘Beebe’ Aldridge took on the saxophone duties with a fresh and exciting dynamic sound, both adding their own dimensions to the musicians that have carried the flag for Climax as a unit for over 25 years, in Les’s case over 30 years, and George for nearly 40 years. A brand new album of original songs is being recorded and will be released in 2018. Now you have a chance to hear some of the exciting new songs off the new album at Corn Market Blues in Corby on Saturday, October 13th, 2018. Corn Market Blues is at The Raven Hall, Rockingham Road, Corby, Northamptonshire.